Dr. Deanna Wilkinson founded the Urban GEMS – Gardening Entrepreneurs Motivating Sustainability – to give disadvantaged adolescents an alternative to violence and an opportunity to explore new skills and opportunities while contributing to the health of their community. 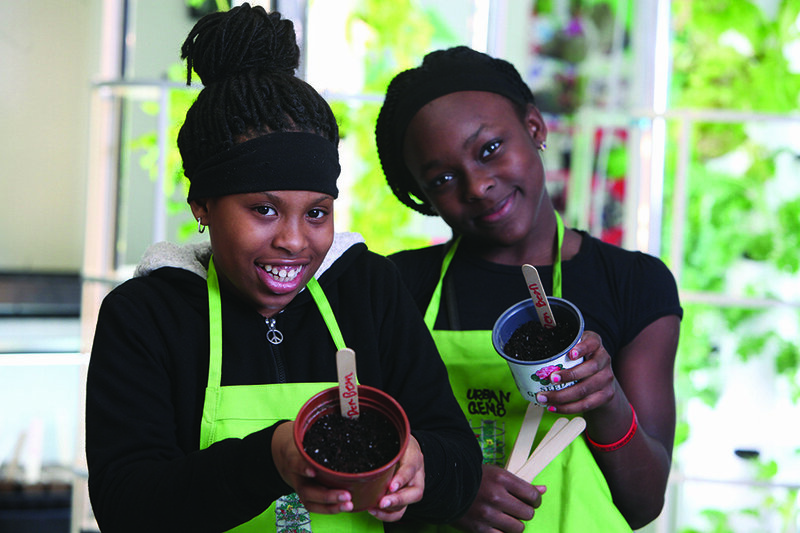 The Urban GEMS (Gardening Entrepreneurs Motivating Sustainability) program, founded by Dr. Deanna Wilkinson, grew out of a desire to design a program that would not only keep kids off the streets, but also teach them valuable life skills while providing them with opportunities beyond the neighborhoods in which they grew up. The program is a multifaceted youth development initiative that aims to enrich the educational, personal and career development of young people in high risk communities. The prevalence of poverty, health disparities, high rates of unemployment, mass incarceration, food insecurity and low educational attainment disproportionately affects urban African American communities compared to their White, Asian and Latino counterparts. Poverty leads to poor health and both of these factors are linked to lower levels of education. In order to address this vicious cycle, the program cross cuts a number of domains including nutrition, health, wellness, entrepreneurship and community efficacy. Urban GEMS aims to improve health related knowledge, attitudes and behaviors amongst young people, while they gain skills in science, agriculture and food production. The team aims to increase participants’ l fresh fruit and vegetable consumption by 50% and improve their knowledge of healthy eating, while learning how to use different systems to grow and harvest crops. However, the effects of a project like this run much deeper than learning how to garden or eat healthier. The research team want participants to grow in self-efficacy and feelings of belonging. The program encourages teamwork, community engagement and education. Through experimental learning activities, the researchers hope to increase teen engagement in high school. By participating in Urban GEMS, youth are involved in a type of active learning that precipitates high school graduation and prepares them for the workforce and higher education. Participants also gain business acumen through connecting with adults in local food production, and learning how to create a sustainable small business model. Youth participants benefit from the expertise of university faculty, extension educators, community school professionals, volunteers and business sector partners. The first Urban GEMS farm was established in February 2017. Here, youth and staff are growing leafy greens on nine towers located in an unused hallway space at an OSU community outreach center. Food grown at the Urban GEMS farm has been donated to help feed the homeless. As well as developing personally, the young participants are encouraged to become more involved in their community. They are supported in educating others and passing on their newfound knowledge of healthy eating and wellness to their families, friends and other members of the community. Their activities are documented through photos, journals and social media, which can be easily shared and disseminated. As well as engaging the participants in disseminating the project’s activities, this work gives young people the opportunity to learn how to use number and word processing software and be actively involved in the research project. The participants also become familiar with public health campaigns which aim to improve community health outcomes for urban African American men (who are particularly at risk for certain diseases). The plan is that this will increase community involvement in changing patterns of food consumption and inspire young people as leaders and problem solvers in this public health initiative. So why gardening? At first glance, a garden may seem like an odd choice for an activity aimed at keeping teenagers engaged in school and out of gangs. In some ways, the connection came about by chance, as many great ideas do. Dr. Wilkinson first learned about aeroponic gardening from a community workshop and quickly developed a passion for it. Aeroponic gardening is growing plants without soil, using only special medium, nutrients, air, and water. Without the burden of large volumes of soil, aeroponic gardens are particularly suited to non-traditional growing locations and are able to produce wonderful crops of fruits and vegetables in even the most limited of indoor spaces. 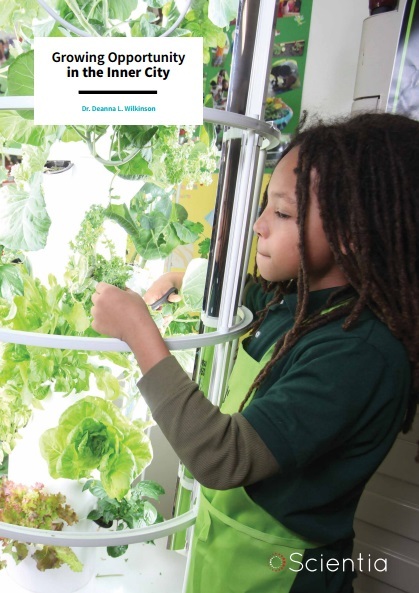 A good amount of produce can be grown in one narrow aeroponic tower that takes up less than 7 square feet of floor space. The program currently operates at two neighborhoods in Columbus Ohio, selected for high rates of poverty, food insecurity, unemployment, high crime rates, and failing public schools. By 2017, the team was leading youth in growing food in 9 locations with a total of 26 Tower Gardens operating. The primary Urban GEMS implementation sites include a high school and a non-profit youth serving organization. The research team has plans to expand opportunities for community youth by creating a sustainable business growing food in ‘food deserts’ with as many as 90 gardens in the next five years. Urban GEMS has also brought a new, positive orientation to the team’s research. With the support of the CYFAR grant, Dr. Wilkinson and her colleagues collect data from the Urban GEMS program to measure the success of the program and identify areas where it can be strengthened to provide the best benefit for the students. Each site offers a uniform program and curriculum in order to ensure consistency across projects. Students take assessments before entering the program, and continue to be assessed during and after their time as Urban GEMS. These assessments not only look at academic achievement, but also health and wellness measures, and other indicators of improved quality of life for participants. The pre-test data results have been used by the research team to inform decisions about program focus and community needs. Post-test data from the first cohort will be collected shortly offering a first test of the Urban GEMS model. The first two years of the project have led to overwhelmingly positive interest from the community with many conversations and activities ignited around healthy eating. The young participants have obtained new knowledge about the many health benefits of the food they grow. The researchers have also observed participants teaching their newfound knowledge to their peers. These students have gained skills as food producers and have had multiple opportunities to prepare, cook and eat their harvests. They have developed the skills to teach others about how the system works from its setup, through its maintenance to the harvest of crops. They have also had the chance to share and trade their fresh produce with local master crop growers. The team have also observed the participants growing as leaders. Attendance at Urban GEMS activities has steadily improved as young people became more involved in leadership roles. The students have connected with professionals through participation in the Urban GEMS advisory board, led team meetings, interacted with adult advisers and volunteers and gained invaluable experience in public speaking. The project has also led to productive interactions with the community as a whole. The youth club, which meets once a week to learn about aeroponic food production, nutrition and social justice advocacy, has held successful ‘salad in a jar parties’, after which they take home food for their families. The young students are also responsible for producing food that is used twice weekly to feed hungry community members who come to the feeding program. Through this, participants learn important life lessons about self-empowerment and becoming a person who gives back to the community. It is onwards and upwards for Urban GEMS. The team anticipate that collaboration and financial backing from non-profits and other relevant organizations will help the sustainability of the project. The workforce component was purposefully developed with a view to attracting stakeholders interested in building a prepared workforce for the future. The Urban GEMS team plan on training middle and high school students in social justice activism around healthy food access in urban areas and conservation of natural resources for sustainable food production. In addition, participants will compare and contrast the aeroponic tower system with traditional gardening in terms of water and energy consumption and the use of climate controlled spaces. The team also hope to secure additional spaces for more towers and explore other ways of generating energy (e.g. using solar panels). Through these endeavors, Dr. Wilkinson and her team aim to build a youth development model worthy of replication on a national scale. 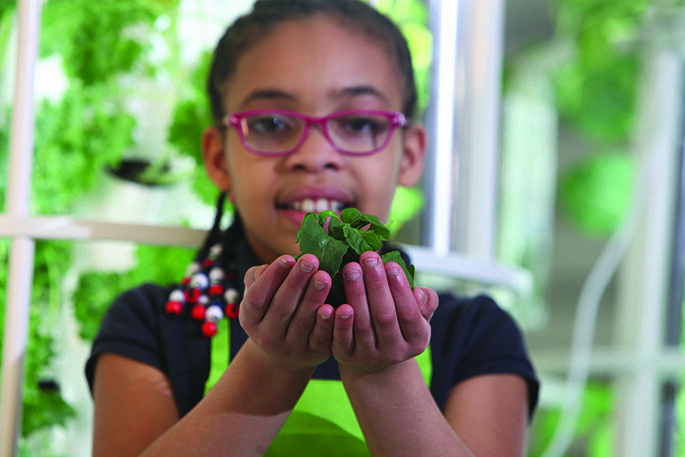 The program utilises aeroponic food production as a vehicle to enrich the lives and learning of the young people in the program through project based learning around scientific discovery, math lessons, historical analysis, nutritional principles, consumer science education and the creative and language arts. Individual and team based learning integrates literacy, numeracy, teamwork and portfolio production in a culturally relevant, positive and empowering learning environment. There is potential to create a legacy with this approach. Small businesses can develop around vegetable gardening using the aeroponic tower system. Coaching students in various fields exposes them to numerous possible career paths such as agriculture, marketing, public health and other health related areas. The GEMS program model is based on the identified needs of the community and the strengths of assembled partners. By creating partnerships with schools, businesses and communities, the project can help to institutionalise change and create new opportunities within a sustainable project. 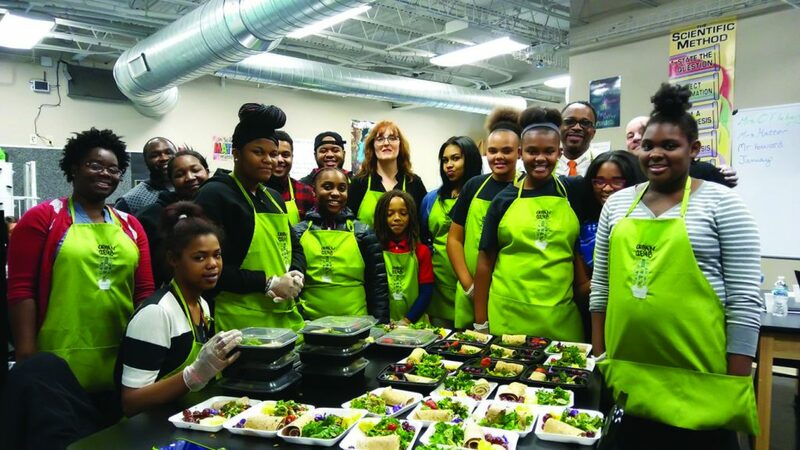 The Urban GEMS program is currently operating under a five-year federal grant from the Children, Youth, and Families At Risk (CYFAR) initiative of the US Department of Agriculture’s National Institute of Food. Dr. Deanna Wilkinson began her education with a BA in Sociology from Cornell College in Mt. Vernon, Iowa in 1990, and continued on to receive an MA in Criminal Justice from the University of Illinois at Chicago in 1992, followed by a PhD in Criminal Justice from Rutgers University in Newark, NJ in 1998. She served as an Assistant Professor in Criminal Justice at Temple University in Philadelphia, Pennsylvania from 1998 to 2005, before taking her current role as an Associate Professor in the Department of Human Sciences in the College of Education and Human Ecology at The Ohio State University, Columbus, Ohio. 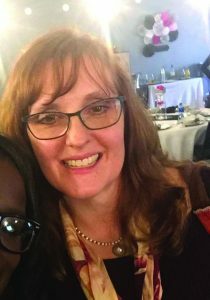 She also holds a courtesy appointment as Associate Professor in the OSU Department of Extension in the College of Food, Agriculture, and Environmental Science. She has dedicated her career to understanding and preventing violence among low-income urban youth, and in 2015 founded the Urban Gardening Entrepreneurs Motivating Sustainability (Urban GEMS) program to provide dynamic educational, career, and community building opportunities to inner ` city teens. This material is based upon work that is supported by the National Institute of Food and Agriculture, US Department of Agriculture, under award number 2015-41520-23772.